Leather settee seats four. DVD, CD and cassette players. Radio, satellite TV Plus includes English and other European languages. Internet is available within the apartment. 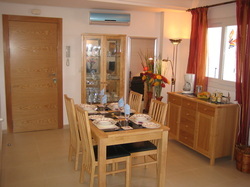 Ceiling fan, air conditioning and mains gas central heating. Sliding window gives access to large terrace which overlooks large swimming pool, fairway to 1st tee and mountains. Dining room off the lounge will seat four. Glass cabinet will display drinking glasses and crockery. Writing desk with storage. Sideboard on terrace. Two bedrooms, two beds in each. Two bedside tables in each bedroom. Double wardrobes have hanging space and drawers. 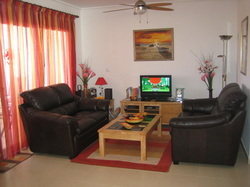 Ceiling fans, air conditioning and radiators. 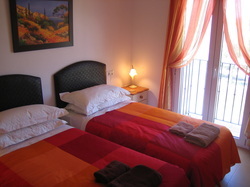 French windows from each bedroom open on to Juliet balconies with view over garden and olive groves. Very peaceful and private. 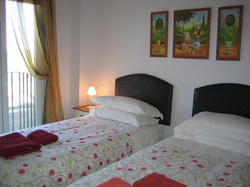 Each bedroom has mosquito blinds and shutters. Large terrace accessed from lounge and dining room with views of pool, first tee and Columbares mountains. A perfect place to eat breakfast, lunch and dinner, shaded from the heat of the overhead sun. Security fence surrounds the pool with a gate that swings shut. The gardens are kept beautifully manicured and site includes variety of colourful shrubs. Pool is cleaned regularly and/or daily in summer months. There are glass curtains to protect the terrace from wind and rain and makes it usable all year round. ​Glass table with six reclining loungers. The swimming pool overlooked by the balcony. Shallow and deep end, entry ladders and a series of steps leading into the pool. 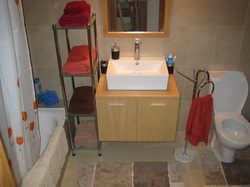 There is a small pool for young children and two showers. 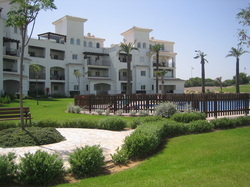 There are 19 pools on site, but it makes sense to choose the one that is so near the apartment. and is so beautiful.